The structure now known as The Haggai Institute of the Mid Pacific has been a familiar site in the Lipoa Street neighborhood in Kihei, Maui since 1977. The intent of The Haggai Institute was to provide a state-of-the-art but comfortable learning facility with amenities such as fitness and game rooms and the most updated technology available on today's market. The computer and projection capabilities throughout the facility are linked in a manner that makes communications in the building above comparison. Only the most up to date furnishings, technology and equipment have been installed and are in use here. Each Wing has 6 stories (above ground) and the Center-core consists of 3 stories (one at the basement level). In square feet, the physical size of the project is approximately 53,000 sq. ft., not including the site work. Area of outside recreation improvements is an additional 48,000 sq. feet. The original dollar value of this project was $5.8M and the final contract amount with added changes increased the final contract amount to $5.9M. Private Prep School housing kindergarten through 12th grade. Located on the North Point of Maui near Kapalua. Made up of multi buildings rebuilt for use as a class one school facility. 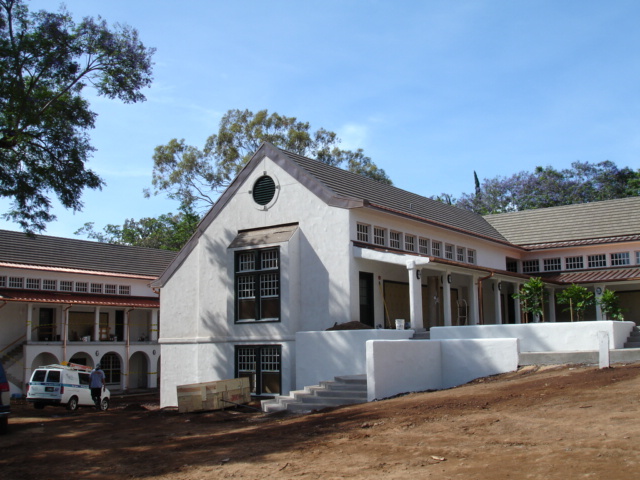 Two new buildings at the Montessori School of Maui were built incorporating environmentally friendly features that won the school Silver Certification from the (LEED) Leadership in Energy and Environment Design program with the (USGBC) Unites States Green Building Council. The new buildings’ feature electric generation from solar panels, irrigation with captured rainwater, indoor air quality, eco-friendly materials and sustainable strategies. Students live and apply what they learn in ecology science classes and demonstrate sustainable living on-campus through the curriculum studies. Maximizing the use of existing topography and trees to create a village of low- maintenance, non-toxic buildings and special-use areas, interconnected by paths and covered walkways. Buildings and outdoor areas are situated to maximize benefits of existing contours and trees. The entire campus has sustainable living classrooms that integrate all areas of the curriculum. Water catchment, storage, filtration, and re-usage constitute a conspicuous feature in the form of cisterns, ponds, streams and water features. Landscaping was indigenous, edible, fragrant, and functional. Extensive application of photovoltaics and solar water heating resulted in net positive energy consumption. Non-toxic, low-maintenance materials were used as a rule. Buildings were designed to maximize natural lighting and ventilation. Indoor-outdoor spaces maximize the students’ relationships to the natural environment. In addition to providing exposure to indigenous plants, the landscape will increase the students’ awareness of Hawaiian culture and history as it relates to this particular place. We consistently communicated with the owner’s about cost~saving tips knowing in fact that their budget was tight to support the schools initiatives of Green Building. It was a unique and fun project as children often inquired with our construction staff about miscellaneous questions. It was our privilege to service them with quality construction. Part of a large 2 phase project which consisted of a new 6,500 square foot middle school. This project was completed on time and on budget in spite of loosing 30 days due to weather delays. Complete Demolition of school, outer buildings, underground utilities, and new construction consisting of 30,000 square foot 2 story upper school.